Whilst most back pain and neck pain issues are resolved with hands on treatments and rehabilitation, when patients need something more for difficult spinal disc issues, clinicians use IDD Therapy. IDD stands for Intervertebral Differential Dynamics (IDD) Therapy, or more simply IDD Therapy for short. Developed in the USA in the late 1990s, IDD Therapy is a targeted treatment which relieves pressure on specific spinal discs and gently restores mobility. It is used to treat low back pain, neck pain and sciatica. Disc problems affect people of all ages. An everyday term for a common type of disc injury is a “slipped disc” or more technically a herniated disc or prolapsed disc. IDD Therapy is best-known as a disc treatment. By decompressing (taking pressure off) an injured or bulging/herniated disc and stretching the soft tissues, clinicians can improve mobility in the spine and allow the body’s natural healing mechanisms to operate more efficiently. In so doing, the goal is to relieve pain caused by muscle spasm and alleviate nerve compression and irritation caused by bulging or herniated discs. But the disc is just one component of the majority of back and neck pain related conditions. 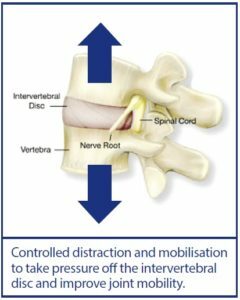 Clinicians treat the disc, but the main goal is to restore function in the spinal segment and improve functional movement within an overall rehab programme. This is where IDD Therapy comes to the fore with a goal to provide lasting pain relief and improved movement without resorting to pain management and/or invasive treatments unless absolutely necessary. IDD Therapy is provided by physiotherapists, osteopaths, chiropractors and medical doctors. Many people are confused by the difference between different medical disciplines. When it comes to IDD Therapy however, all clinicians understand the limitations of manual therapy and are united in the use of IDD Therapy to decompress and mobilise spinal segments. The reason for the machine is because the manner in which the controlled forces are applied with IDD Therapy simply cannot be replicated with manual therapy techniques. Osteopath Tim Hanwell talks about how IDD Therapy helped resolve his back pain and sciatica. Clinicians: We are happy to arrange for you to visit an IDD Therapy provider if you would like to see IDD Therapy. If you would like to receive details about providing IDD Therapy at your clinic or hospital, complete the form below and we will be happy to assist you.